Familiar with the phrase “always a bridesmaid, never a bride?” Well for me, that was partially true up until this year. 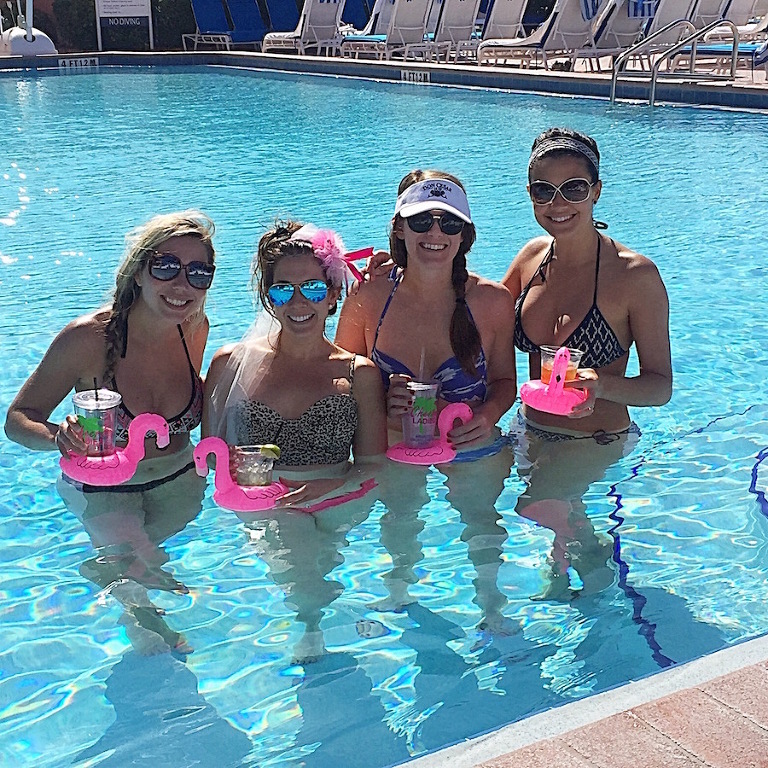 I have been a bridesmaid quite a few times, but now as a bride I was ready to have a relaxing Tampa Bay “beach-lorette” bachelorette weekend with my best friends by my side. I wanted to host a semi-local bachelorette party to accommodate my Floridian friends. After all, Tampa Bay has some of the best beaches in the country! Searching for a laid back and relaxing weekend retreat, we delightfully chose the The Don CeSar Hotel on St. Pete Beach. 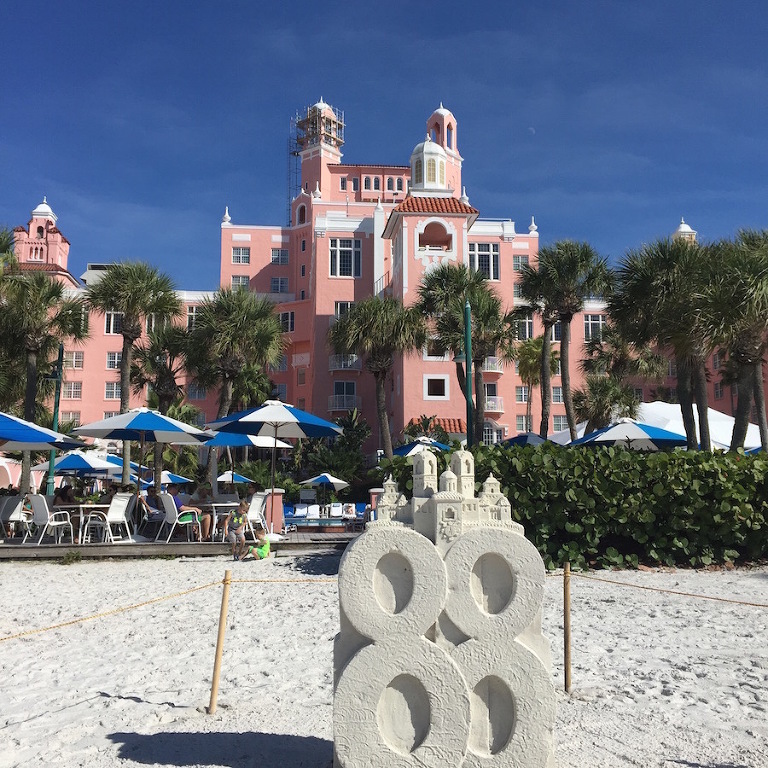 The timing of our stay was perfect, as the Don CeSar was celebrating their 88th birthday! From the moment we booked our “beach-lorette” weekend, we were treated like a VIP. Our concierge Meghan greeted us with an email prior to our arrival and also a phone call the morning of to ensure that we were all set. Despite the weather forecast predicting a cold and rainy weekend, it ended up being perfect! We spent the weekend with our toes in the sand watching the sunset, while enjoying the beautiful night sky with happy hour at the hotel bar. To kickoff our first full day at the “Pink Palace,” we started with beach yoga led by a local instructor, one of many amenities provided by the Don CeSar. Listening to the soft rhythm of the waves, while getting our bodies relaxed was a must on our list. From there, we spent our afternoon at the one of the property’s two heated, oversized pools. The poolside service was absolutely top-notch! Our server Lucy was such a sweetheart and made us feel so welcomed. 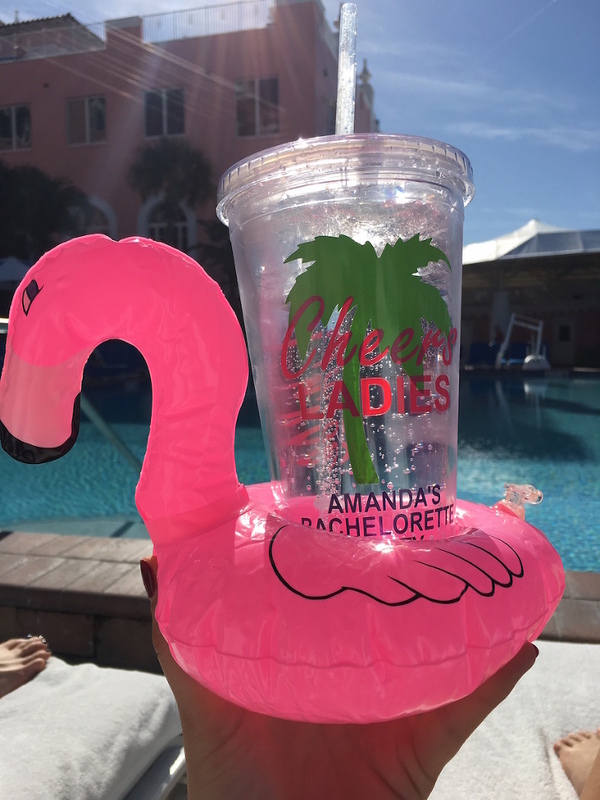 What’s cuter than a pink and white straw to compliment your fruity tropical beverage as you bask in the Florida sun with your favorite ladies? While we didn’t have a chance to make it to the resort’s 11,000 square foot Spa Oceana, though next time I’ll definitely add indulging in one of the 16 treatment rooms, the whirlpools or steam rooms to our itinerary. After a gorgeous day at the beach, it was time to get dressed up for dinner. Since we decided to keep the weekend relaxing, we swapped the typical bachelorette festivities for a dip in the hotel’s hot tub and enjoyed the cozy robes provided in our rooms! Concluding the weekend, the girls and I said our goodbyes at the Don CeSar’s Sunday Champagne Bruch Buffett at the Sea Porch restaurant. There are a great number of traditional breakfast items on the menu, but you will not want to miss the made-to-order omelets, custom carving stations and dessert available at the buffet! TIP: Make a reservation, as the restaurant also serves not only hotel patrons and that weekend’s wedding guests, but lots of locals also have “Sunday Funday” at the Sea Porch. If you still have room for dessert after, visit the resort’s on-site ice cream shop, Uncle Andy’s Ice Cream Parlor, which features milkshakes, banana splits and sundaes made with authentically local, homemade small batch ice cream. We rounded out the weekend with a champagne toast, sandcastle and cake pops! It was truly a memorable experience. We’ve already decided to start a new tradition to have a girls weekend getaway at the Don CeSar to relax and rejuvenate! Amanda Sobel is the Membership Director for Marry Me Tampa Bay. She loved planning her own wedding so much that she decided to join the Marry Me Tampa Bay team and now spends her days swooning over gorgeous local weddings. Amanda is a native Floridian who grew up in the small beach town of Jupiter on the east coast of Florida. After graduate school at Auburn, Amanda had her sights on settling down in the Tampa Bay area. Shortly after relocating back to Florida, Amanda met her husband David. The couple wed in February 2016 in Clearwater Beach at the Sandpearl Resort. Utilizing Marry Me Tampa Bay as a bride, she was able to book several reputable vendors who were highly respected in the Bay area. Amanda and her husband have three puppy children and enjoy spending their time outdoors. She is a fan of all things sparkly, flamingos and pineapples and can be found testing out new recipes and living a healthy lifestyle.